Peel the avocado and pit it, then slice the avocado into small chunks, around a centimeter or half-inch per side. Juice half the lime. Add the lime, some salt, and a moderate amount of red pepper to the avocado chunks. Stir until blended. Err on the side of adding too little spice; it's easy to add more, but too much makes the guacamole really scorch. Mash the ingredients together. Works well on beans, in tacos and other Mexican foods, or even as a topping for bread. It also can add flavor and moisture to overly dry food. However, perhaps the best use is as a dip for tortilla chips. True guacamole is only mashed avocado with cilantro, and onion, optionally (yet desirable) hot peppers can be mashed along with the avocado. Oil is never used, olives aren't Mexican, so olive oil should be avoided. It should also be noted that guacamole is a dip sauce originally made so it will be consumed almost instantly, meaning there is no intention to store it at all, so you can omit the use of any kind of oils for these recipes, or even lime juice. 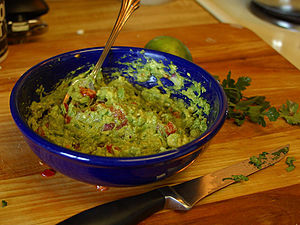 Both oil and lime juice are added so guacamole lasts a bit longer than normal. An old Mexican trick to avoid or reduce the brown oxidized layer on the top is to put the whole avocado pit back into the guacamole once it's prepared. Never cut the pit in pieces; that will make the guacamole bitter. This trick doesn't really work though. The only way to prevent the oxidation is to eliminate the exposure to air. Covering the surface with plastic wrap so no air is in contact with the sauce works well. Be sure to include some lime in your recipe, this will prevent such oxidation.